I am a massive fan of manuka and searched the web for hours to find a natural toner containing it. 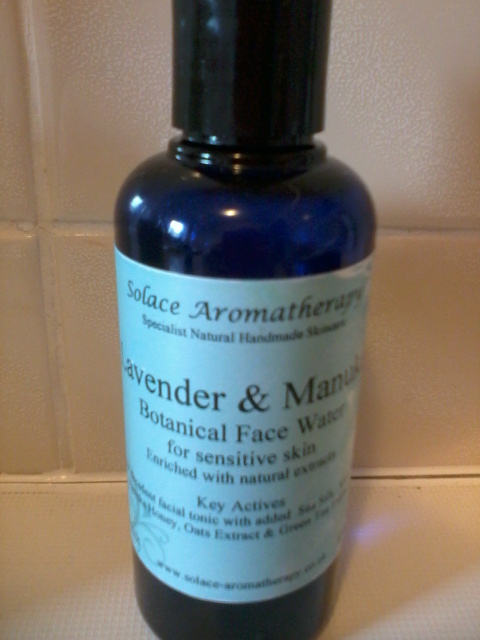 By pure luck I came across Solace Aromatherapy on Ebay. Solace Aromatherapy offer a wide variety of toners which are categorised by skin type - sensitive, acne/oily prone, dry/damaged, ageing and normal/combination. It is worth spending the time reading about each toner and it's ingredients to learn about the benefits. In the end I chose to purchase Lavender & Manuka which is described as "A very gentle facial tonic, soothing for sensitive skin, prone to irritations. Laced with Sea Silk, Aloe Vera Juice, Manuka Honey, Oats Extract CO2 and Green Tea Extracts." I am going to refrain from a detailed review about this product because let's face it we all know what a toner looks like and how to use it. What I will say is this toner does not feel stripping or drying and I have not suffered any irritation. "Some of our formulations are preservative-free including our Facial Oils, Natural Cleansing Oils etc. We do use preservatives when absolutely essential for product safety. Where natural preservatives are not available, we use relatively low concentrations 0.5% of the highest grade, broad-spectrum preservatives, Phenoxyethanol as advised by our Cosmetic Chemist. It is particularly effective at protecting water-based products, such as moisturisers, from bacterial contamination. It is mild enough to be used safely on the skin." It is worth checking out the website or ebay store as toners are not the only skincare products available from Solace. Some of you may not wish to use products with preservatives but do not dismiss the Company altogether since it is not in every product. My one criticism is full ingredient listings is not available next to items, so you may need to contact the Company if you have any concerns. I recommend you give it a try, I like it, I was going through a funny stay with the smell of my last one, just kept smelling of vinegar??? I have come to realise my nose favours lavender which is good as it's the perfect ingredient for many skin types.